AvantiPRO Diamond Blades are the perfect choice for DIY users that need a blade that is made to last. The turbo diamond blade is great for fast and smooth cutting of concrete, brick, block, stone, and stucco. For use with angle grinders. This segmented rim dual purpose diamond blade, part of Makita's Optimum Series - Bond Matrix is engineered to provide the optimal balance between wear, fracture and exposure in order to maximize the cutting ability of the diamond content. Optimum Blades cut faster, longer, and smoother than the competition in a variety of materials and are ideal for those projects that include cutting concrete and asphalt. This segmented rim general purpose diamond blade, part of Makita's Optimum Series - Bond Matrix is engineered to provide the optimal balance between wear, fracture and exposure in order to maximize the cutting ability of the diamond content. Optimum Blades cut faster, longer, and smoother than the competition in a variety of materials and are ideal for those projects that include cutting cured concrete, block and brick. This turbo diamond blade, part of Makita's Optimum Series - Bond Matrix is engineered to provide the optimal balance between wear, fracture and exposure in order to maximize the cutting ability of the diamond content. Optimum Blades cut faster, longer, and smoother than the competition in a variety of materials and are ideal for those projects that include cutting cured concrete, block and brick. 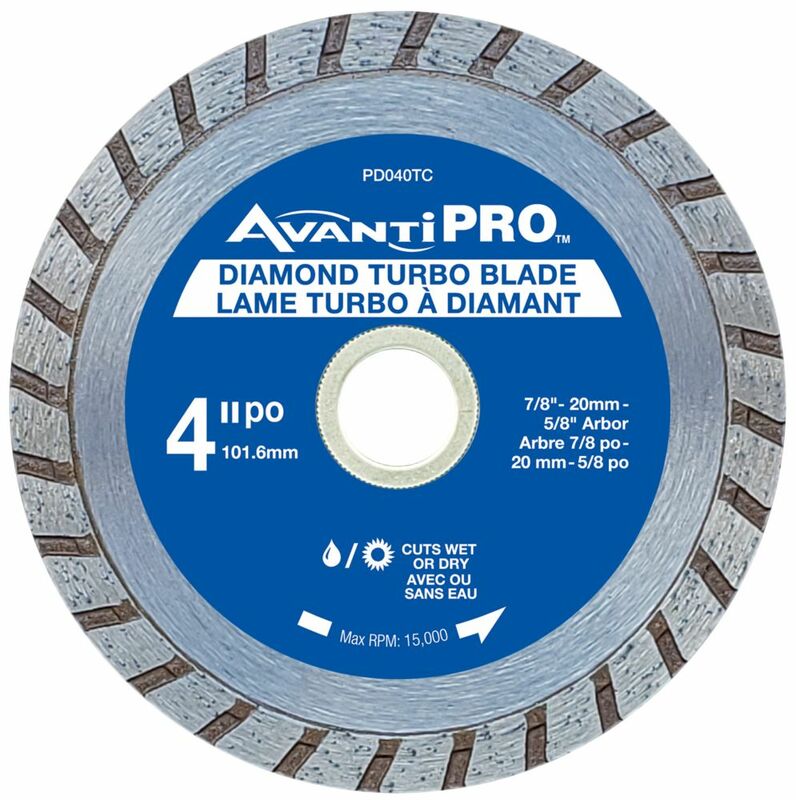 4 inch Turbo Diamond Blade AvantiPRO Diamond Blades are the perfect choice for DIY users that need a blade that is made to last. The turbo diamond blade is great for fast and smooth cutting of concrete, brick, block, stone, and stucco. For use with angle grinders. 4 inch Turbo Diamond Blade is rated 4.3 out of 5 by 96.